Minimum effort – maximum benefit: With the decentralized MOVIFIT® compact motor starter. It is ideally suited as a reversing starter or as a dual-motor starter. For your intralogistics applications. Convincing installation concept: Simple connection and wiring technology. For efficient materials handling technology: MOVIFIT® compact, the decentralized basic motor starter, available as a reversing starter or as dual-motor starter. 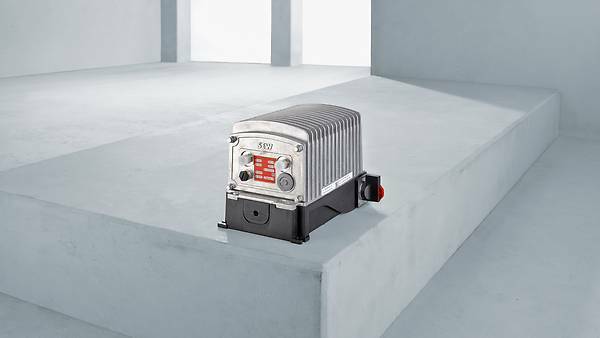 Less is more: we have reduced the MOVIFIT® compact to include only the functions and features necessary, and its design means that it is the ideal motor starter for the lower function range. It covers the 4 kW or 2 x 2.2 kW power range. The motor starter is available as a reversing starter or as a dual-motor starter. The reversing starter enables motor operation in two directions of rotation. Alternatively, you can operate the dual-motor starter with two motors that convey the material flow in one direction independently of one another. In this extremely efficient concept, 2 motors share one MOVIFIT® compact motor starter. Project planning, installation and startup is even easier with this member of our drive controller family. It seems only natural that we have also integrated a power bus for field installation. Extremely short installation times? Yes! You want to reduce investment costs for your systems? This is also possible. Thanks to consistent integration of the power distribution with innovative and reliable connector technology. The energy for AC 3 x 400 V is distributed via the FieldPower® terminal from Weidmüller, which is integrated in the unit. Two sensors can be connected to the unit in addition to the drive function when using AS-Interface. These are signaled to the system controller via AS-Interface master without additional costs and the signals can then be processed in the system controller. If you require a little more flexibility in terms of motor control, the MOVIFIT® compact, basic inverter is the right solution. We have the know-how and tools to provide you with optimum advice and support. thanks to the consistent use of standard plug-in connections for control and motor connection.